Posted July 6, 2017. Filed under Art Workflow, Materials, What Is ... ?. Tags: material, shader, stock resources, texture. Textures.com, formerly CGTextures.com, is a subscription based stock resource website for texture maps. 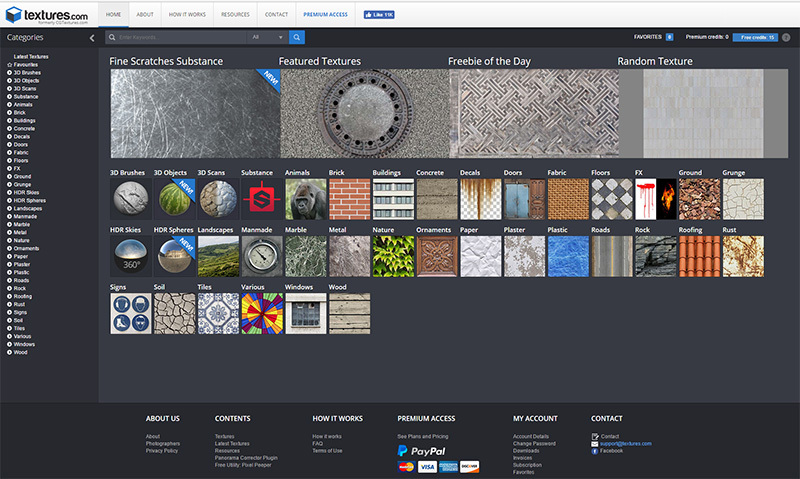 Depending on the subscription level, the user has a certain number of credits per month to use on textures. There is also a free option with a small number of credits that regenerate on a daily basis. The textures are royalty free for both commercial and noncommercial use, are high resolution, and have been processed to remove distortion, color cast, and in some cases to add tiling. They are distributed at multiple sizes, with larger sizes requiring more credits.